← The 72-year wait is almost over! I know I started this series of posts about the men shown in an old photograph of the St. Joseph Band some time ago. Sorry I had to put it down for awhile. But the KNAPP family has been pretty busy the past year or so, dealing with health issues, weddings and other events. But I decided to pick up where I left off with John PALM. He is the trumpet player in the photo. Although it might be a coronet. I am not sure. Sometimes when you’re doing genealogical research, you don’t always have every piece of the puzzle. It can take years before you find the last piece that allows you to make the connection. So anything that looks promising, you record and store for later review, as more data becomes available. That’s a pretty good description of where I am with John PALM and his mother, Katherine KNAPP Palm. Awhile back, while researching something else, I stumbled on a reference to an Adam KNAPP, born in April 1817 in Germany, who married Eva whose last name may have been CLUTTY or CLUTE. Eva was born in 1837 and died in 1861 in Suffield Twp., Portage Co., Ohio. The couple had a daughter, Katherine KNAPP, born 4 March 1860. Katherine/Kate/Catherine, and who died 29 Dec 1915 in Suffield Twp., Portage Co., Ohio. At the time, I didn’t make the connection between any of our KNAPPs, but I filed it away anyway. That didn’t mean I didn’t have my suspicions, of course. 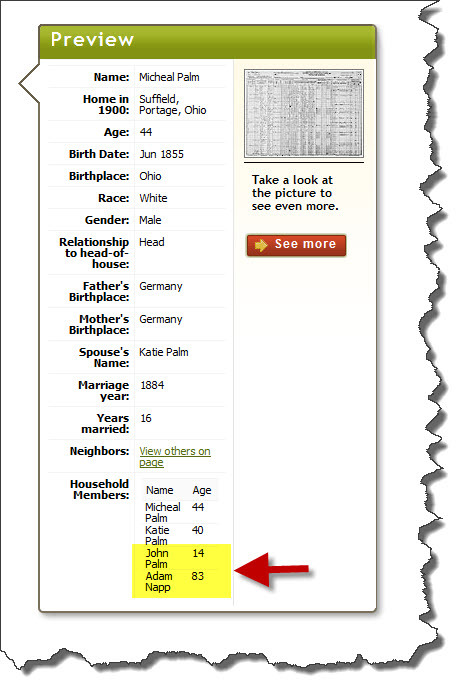 I was pretty darn sure there was a connection – especially when you take a look at the 1900 U.S. Census, which shows Michael Palm, his wife, Katie, and son, John Palm, living with Adam Napp, age 83. I believe that this is Katie’s father, Adam Knapp. I believe there is a strong possibility that Adam KNAPP is related to our Suffield Knapps. It is very telling that he appears in the photograph of the Randolph Band, since practically all of the band members are related in some way. I don’t have proof or documentation yet – just a hunch. I am still working on making that connection. I will find it – someday. I did manage to get out to St. Joseph’s Cemetery and photograph John Palm’s resting place, along with the graves of his parents, Michael and Katie Palm. Although I have no definitive proof yet, I think there is enough evidence to suggest it is highly likely that John PALM is also related to the KNAPP clan, through his mother, Katherine (Katie) KNAPP PALM. The PALM family came from hardy German pioneer stock, as you can see from reading John W. PALM’s grandmother’s obituary. Below is the obituary of Mary Eva Elise BAUCH/BAOUCH. It is very informative, as it explains exactly how the PALM family came to Randolph, Ohio. Marie Eva Elise Bauch (Baouch) was born May 7th, 1824 in Laxidenbach, Baden, Germany. She was the daughter of Marx and Catherine Reiterman Baouch. With her parents, one sister and brother she came to this country in l847. It took them sixty-one days to cross the ocean on a sailing vessel. When they landed in New York, she remained with friends while the rest of the family came on to Ohio to join other relatives. One year after she married John Adam Palm, who came to this country from Hampistupt, Bavaria, a province of Germany in the year 1828. They continued in New York State until 1852 when with their three children they came to Ohio by way of Buffalo and Lake Erie to Cleveland. They traveled part of the way from Cleveland to Rootstown in wagons and were exposed to cold and rough weather.The children took sick on the way and all three died soon after reaching Rootstown. They bought a small piece of land in the southwest part of Rootstown township where they built then a home and where the deceased lived for more than fifty years. There were nine more children born to them, all living except one daughter who died October 1st, 1870 aged seven years. Her husband died on March 15th, 1871, in his fifty second year. Last April, she left her old home to make her home with her children. She died at the home of her daughter, Mrs. Kate Byers, in Ravenna, aged 80 years, 6 months and 22 days. The funeral services were held at the church of St. Peters in Rootstown, December 1st, Father Lindesmith, her pastor, conducting the ceremony, her four sons acting as pallbearers. She was laid to rest beside her husband. A large company of neighbors and friends gathered there to honor the memory of one long known and well beloved. She is survived by eight children, namely, Adam Palm, Mrs. Kate Byers, Mrs. Eva Stough, Ravenna; Mrs. Rose Hallock, New Milford; John Palm, Rootstown; Michael Palm, Suffield; Joseph Palm, Edinburg; Mrs. Lucy Delano, Industry; also, 27 grandchildren and 2 great-grandchildren, one sister, who lives with her family in West Bend, Wisconsin; and one niece, Mrs. James Miller, of Ravenna; a few other relatives and a host of friends and acquaintances who mourn her loss. Note: The John Adam Palm house was located on the property at the SW corner of Tallmadge and Kline Roads in Rootstown. This entry was posted in Family History, Kline/Cline/Klein, Knapp, Local History, Obituaries, Palm, Portage County, St. Joseph Band, St. Joseph Randolph, St. Peter of the Fields Rootstown and tagged John W. Palm, Katie Knapp Palm, Michael Palm. Bookmark the permalink. Really enjoyed seeing the obit for Mary Eva Bauch. She is my 3x great grandmother through her son John and grandson Roy. They were strong people.